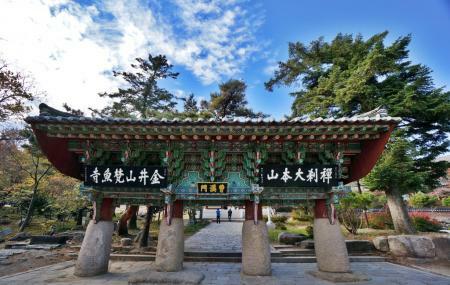 Beomeosa temple (Fish Sutra temple) is one of the greatest and worshipped Buddhist temples of Korea. Located on the top of Mt. Geumjeongsan, this temple is a worth place to pay visit. This temple has been destroyed and reconstructed many times. The present one that you see is not the original temple. It has 3 levels - the 1st one has three gates, the 2nd has Pojaeru and the 3rd level has the main hall. The entire craftworks of the gates, i.e. Cheonwangmun Gate, the Iljumun Gate and the Daeungjeon Hall (the main hall) are quite impressive. The moment you enter the main hall, you can almost feel the devotion of the devotees. On the ceiling of the temple, you can see flower carving depicting the legend of flower falling from the heaven whenever Buddha used to teach his devotees. Visitors can sign up for Beomeosa templestay program that features like chanting services, 108 prostrations, Dado (tea ceremony) and Seon Meditation program. Also, visit the popular attractions in the city by following Busan itinerary 1 day. Restrooms for handicapped are available. Interpretation (in English) service offered. Other contact number is +82-51-508-3636. How popular is Beomeosa Temple? People normally club together Sea Life Busan Aquarium and Seokbulsa Temple while planning their visit to Beomeosa Temple. People also prefer to start their day with Beomeosa Temple. Beautiful temple site with historic and old items. The surrounding mountains, streams, forest areas are totally amazing. Not far from the subway station. Pretty and the hike is refreshing. It's along the road though so don't expect a secluded hike. The temple is active so there will be people praying and services going on. One of the most spectacular Buddhist temple sites I’ve ever been to. After going here I came back several times including participating in the temple-stay program where I learned more about the place. It is the main Zen meditation temple complex in Korea. It’s location on the mountain adds to its beauty and serenity. Great temple to walk around, very beautiful when the lanterns are up. Hiking trails near by. If you have the time to burn, walking to a temple always makes it feel more rewarding. Of course excellent company is important as well.